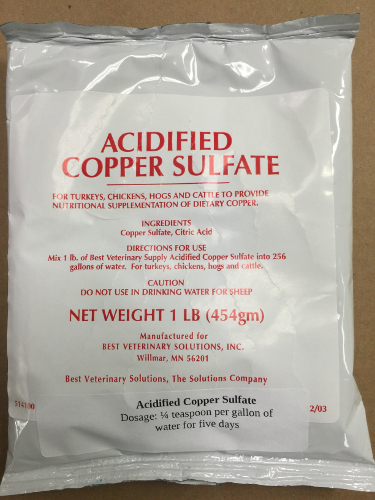 For Turkeys, Chickens, Hogs and Cattle to provide nutritional supplemention of dietary copper. Poultry should be over 3 weeks of age. This must be administered in glass or plastic waterer. Hi is the acidified copper sulfate considered an antibiotic? Yes, Acidified Copper Sulfate is an antibiotic. It is safe to give to all birds over 3 weeks of age.